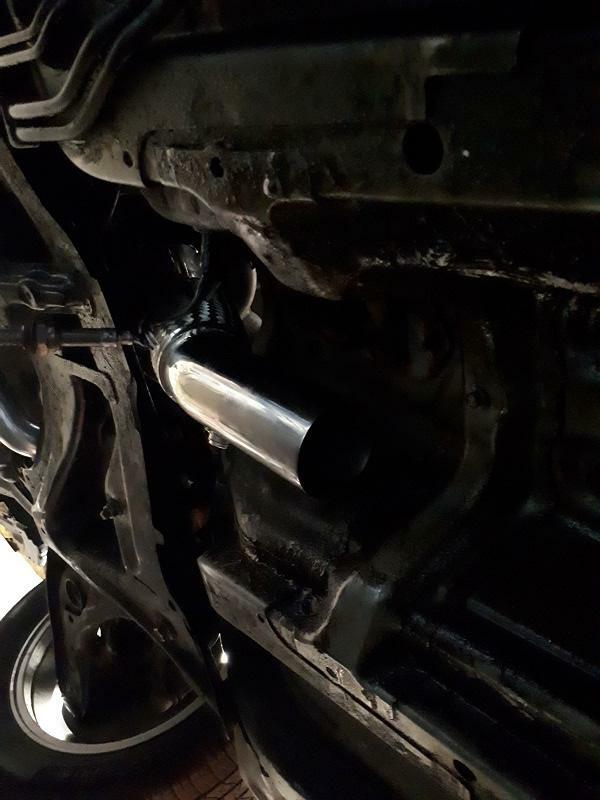 I would recommend just taking an air hammer or cutoff wheel to the flat part of the subframe touching the pipe from the turbo (then repaint). That part isn't very sructural and is mostly just left over from when the steel is stamped. That is the part of the subframe I air hammered on mine to better clear the transmission to make it easier to remove and re install. Thanks! I will do this as you recommend, however, it's the upper rounded corner section of the sub frame that the hose of hitting. It's actually not touching the stamped steel lip, but it might when the engine torques, so, yes, I will do as you recommend. The challenge will clearing the upper forward part of the subframe. It's likely going to require some combination of couplers. I'll try to get a better pic of what I'm describing. My other issue is that I have very little room for an air filter. The smallest filter that even stands a chance of fitting between the turbo and frame/firewall has a flow rate of 283 CFM (K&N RU-2420). The filter that comes with the kit (K&N RU-3700) is rated at 380 CFM. According to various CFM for boost calculators, I'd be close to - if not slightly over the limit with the 283 CFM filter at 0.55 bar (~8 psi). I'll post a link to a couple calculators below. So, this brings me to the question of which approach to take. I'd love the have a large filter positioned where the stock airbox goes for a few reasons: colder air, larger CFM and less chance of filter loading from road debris resulting in reduced filter flow rate. But, obviously that necessitates an extensive custom intake set up which is both expensive and complicated to install. My target is about 7 psi boost, so I could probably get away with the smaller filter attached to the turbo, but I think it's less than Ideal. I'd rather a larger filter, honestly. Last edited by 06YarisRS; 04-14-2019 at 12:51 PM. Looks like a battery relocate is on the horizon? Haha, I certainly hope not. There's actually lots of room in there for a good sized filter. After all the tweaks I'm having to do, I really don't want to tackle a custom intake, but I really think it's the best route in the long run. 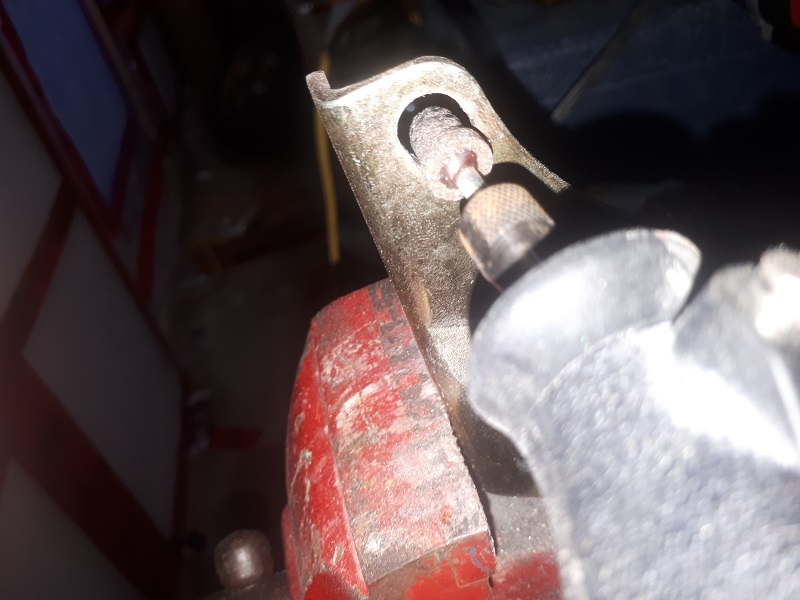 I'll tell ya, I wish I'd been able to access some of this stuff before struggling with making this bloody turbo outlet coupler clear the subframe. 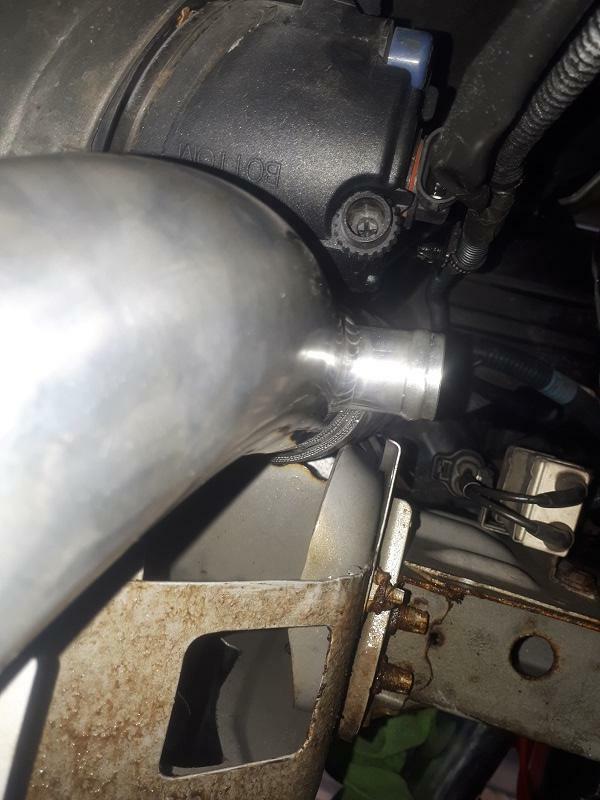 In order to get clearance for the coupler coming off the turbo - it was hitting the subframe - I had to reclock the turbo a few degrees, aiming it a little more straight down. Of course, this put sideways strain on the wastegate actuator arm. 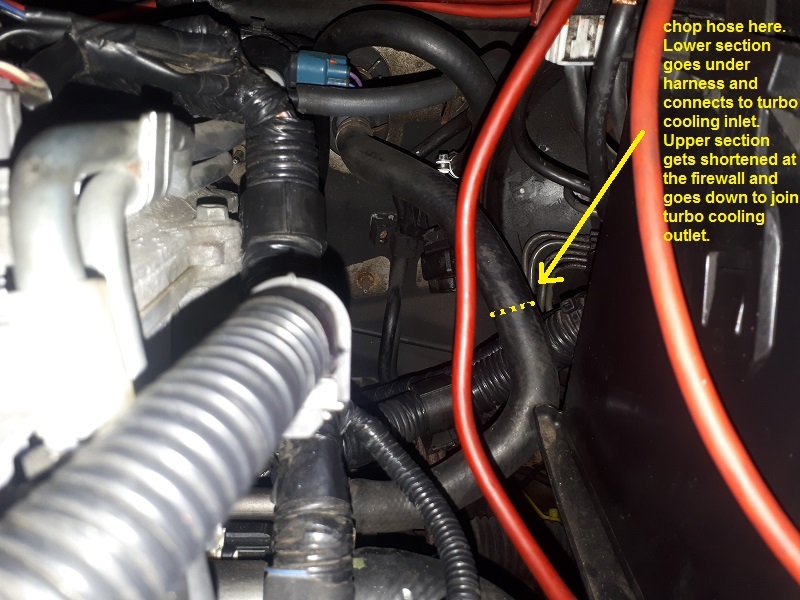 This would not be good as it might not jam, but it might bind a bit - not something you want happening to your wastegate actuator. I used my dremel tool to make the bolt holes in the actuator support bracket into slots. I also made slight slots in the holes where the actuator mounts to the bracket as well as englaged the hole that the actuator arm goes through. 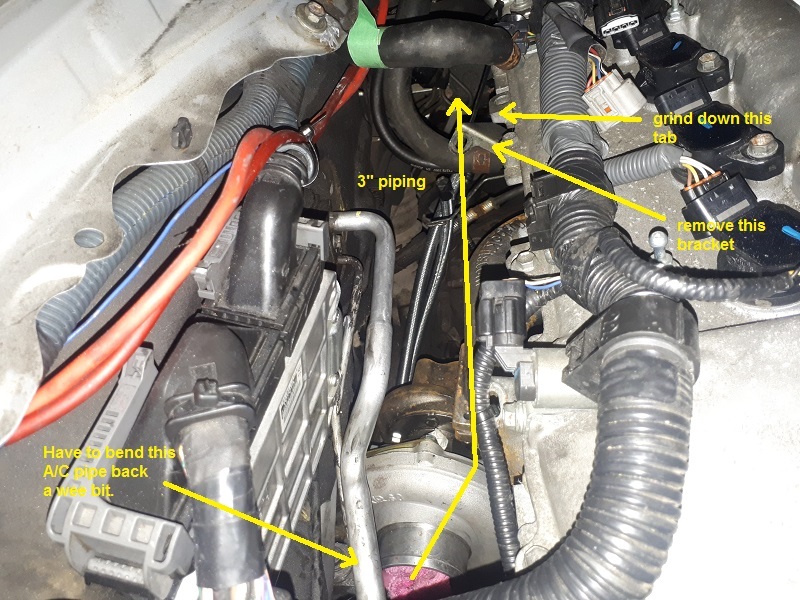 With the turbo re-clocked and the two above modifications, the actuator arm is once again at 90 degrees to the actuator and the wastegate arm. I also managed to gain 1/4" clearance between the couple and the subframe. Before the pipe was pressed against the subframe and deformed. 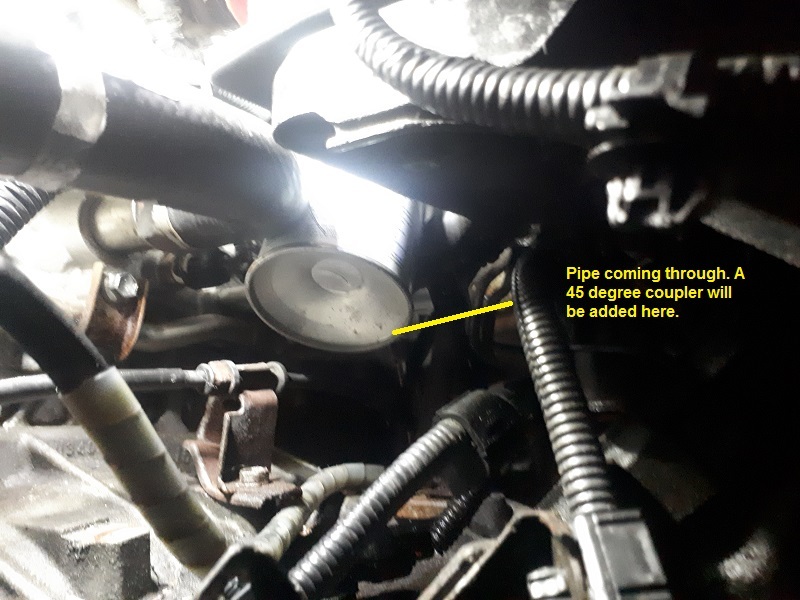 I'm pretty sure there will be no issues as if the pipe makes contact with the subframe under load, it will just be pressing a bit on the flexible coupler and not rubbing per se. Once I attach the forward intercooler pipes, I can pull it a bit farther from the subframe. There is a bracket that attaches another rubber coupler a bit farther forward to one of the AC compressor bolts which will hold everything in place. The coupler is touching the oil drain braided hose, but I'm not concerned as these two items move in unison. I'll put a little rubber tubing between the braided hose and turbo coupler for good measure. I would say yes to a custom manifold and clearance providing there was room for the wastegate actuator as it is between the block and turbo. I wish the kit had come with the option of a T25 for two reasons: more clearance and faster spooling at lower rpms. I expect you could do anything with custom exhaust and charge/intake piping. On another note, I'm considering picking up a different intercooler. 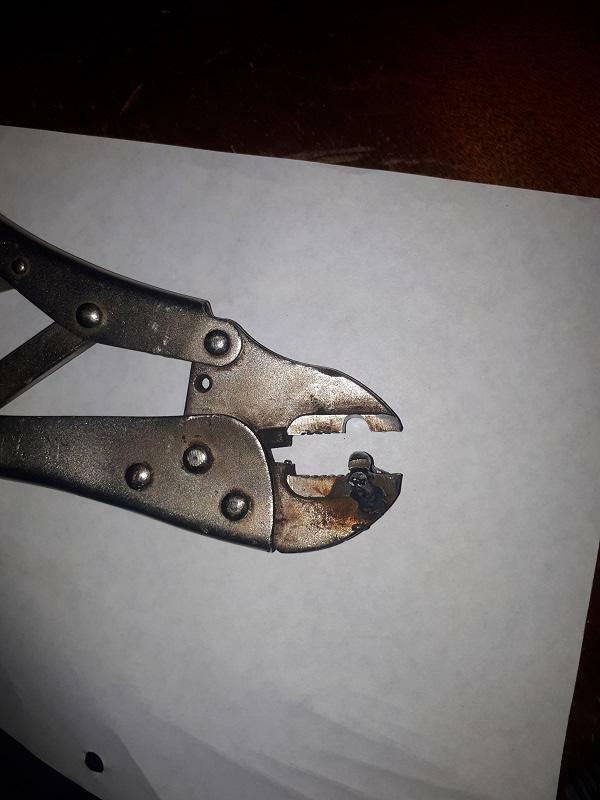 Ebay has ones with lower ports that wouldn't require me to cut as much body metal. Plus, they have threaded fittings on the bottom and top as opposed to the brackets which would make install much easier. The ones I've been looking at are also 2" or 2.5" deep as opposed to the kit intercooler at 3". Frankly, this intercooler is going to be a bit of a PITA to install in the Yaris. Before starting to go crazy with my grinder, I figured I'd better put the front on the car so I could actually see what space restrictions I'm dealing with. Well, I thought I would have more space near the foglights. As you can see in the picture below, There is just enough space for the pipe to go down through but the piping rubs on the corregated crumple zone and the foglight body. If I remove the crumple zone tabs, there will be adequate room. However, I'm not really enthusiastic about that, so my plan is to bend them upwards to the frame. 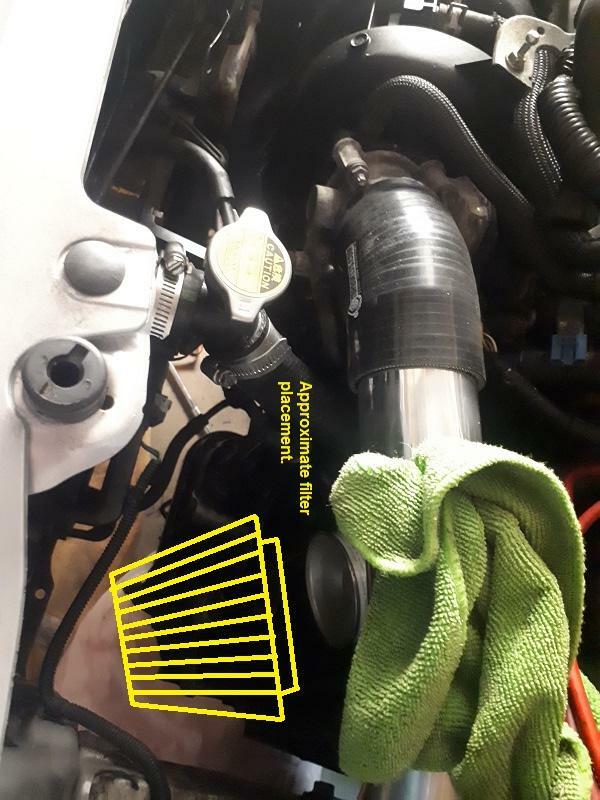 I will have to cut the piece of charge pipe that has the blowoff valve, just below where the blowoff valve mounts and then use some different angled couplers to make it mate with the intercooler outlet. I think a lot of this could be simplified with an intercooler that has the inlet and outlet at the bottom. I'm also coming up at a bit of a loss as to how to mount the intercooler. The brackets that come with the kit for the Corolla are useless in this project - but that's to be expected. I hope to make a decision about which intercooler I'll use but first want to check with the guys at turbokits.com to see if it will in any way affect the tune. I don't think it will, but I'm trying to keep the kit as close to the way it came as is possible. There is one small upside to all of this though. 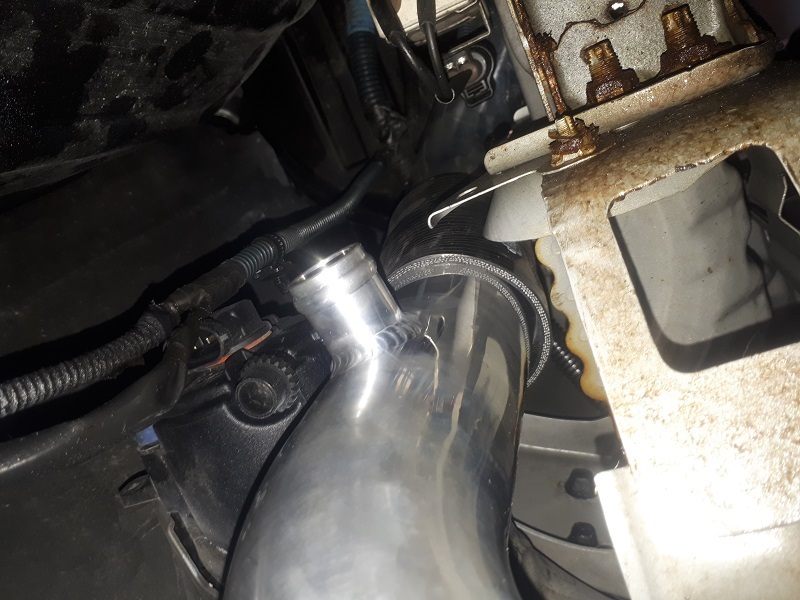 The angle I have to put the blowoff valve pipe at necessitates a rotation of the MAF (intake to throttle body pipe) which now gives me more room between this pipe and the battery - a good 1.5" - 1.75". Bonus! May plan is to use longer couplers and not push the pipes in too far. This should give me lots of flex in the system to accommodate engine torquing. Last edited by 06YarisRS; 04-15-2019 at 06:21 PM. Thanks, WeeYari! I appreciate that. The documentating helps me maintain enthusiasm as I encounter one challenge after another. It also keeps me focused on what needs to be done next. I think there's something inherently wrong with me, in that I crave these projects even though they amount to one minor frustration after another. I have spoken with the guys at turbokits.com and a different intercooler would, as suspected, have no impact on the operation of the system, or the tune. So, I am ordering an intercooler and a series of pipes and couplers this evening. I'll post up some pics of the parts and an explanation of my plans. I'm also ordering a bunch of 3" piping, couplers, clamps etc to build a custom air intake for the turbo. 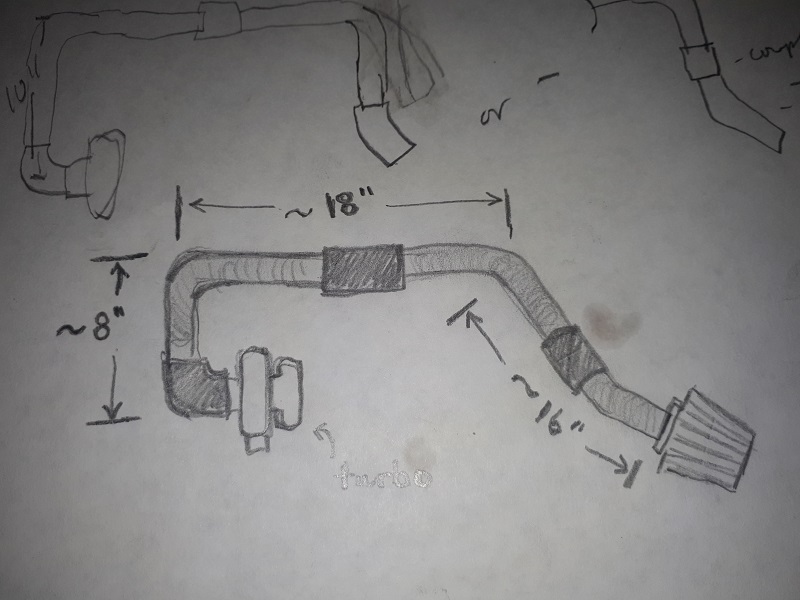 Here is a sketch of my intake setup. The main two upper pieces are 3" 90 degree elbows. The piece that attaches the filter to that is a 45 degree elbow. This piping runs behind the engine, then takes a 90 degree turn forward and goes under the rad hose and MAF pipe. 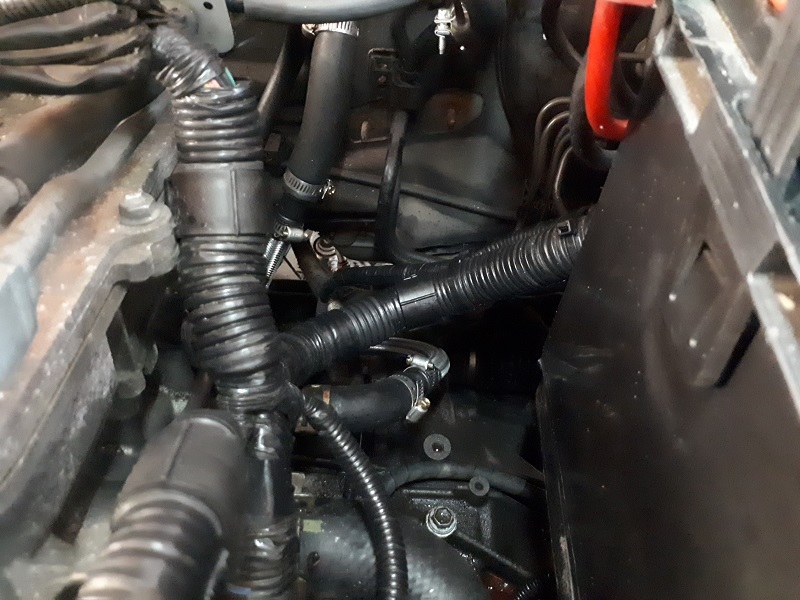 The heater hose that attaches to the side of the block is being re-routed anyway as it's cut to supply the turbo for cooling. It will be tight but doable. It will need supports along the way. Fortunately, all of this is attached to the engine and therefor moves with the engine, so rubber padding to avoid chafing will need to be minimal. This places the filter right beside the headlight and down 4" - 6", where the OEM airbox used to sit. Sound be fun! Pics. I may decide to use a 45 degree coupler and short piece of straight pipe where the filter attaches. The couplers do give a little extra flexibility. We'll see how it goes. 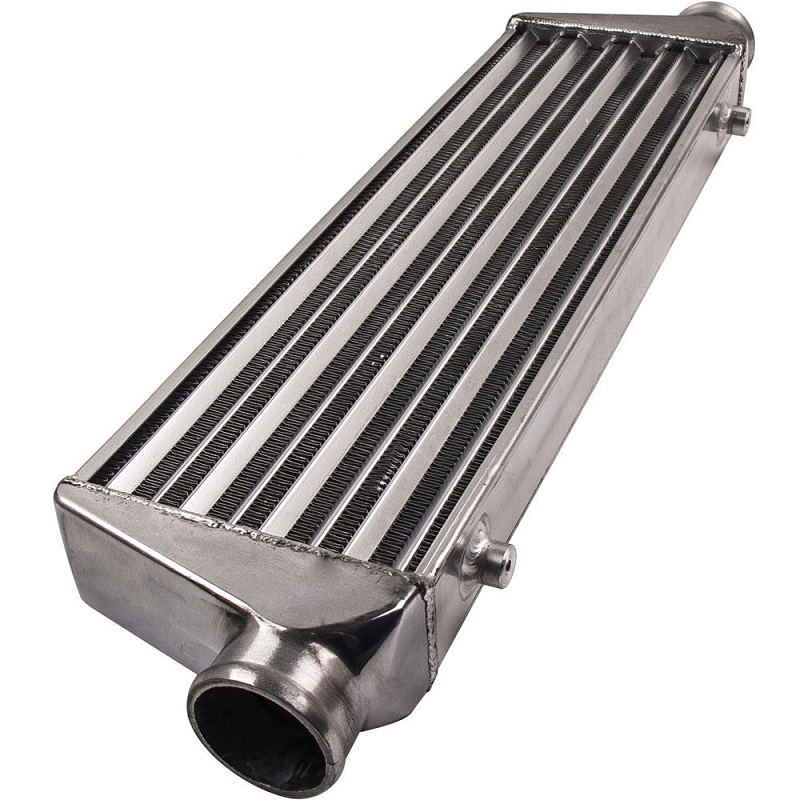 Here is the intercooler that I plan to buy. It should make installation much easier and give me more room and better mounting options. It is a tube and fin as opposed to a plate and fin, but, again, I'm running such low boost that heat shouldn't be any issue. With the cold air intake I'm planning, I could probably get away without an intercooler altogether, but I wanna play it safe. My homemade bead roller. I couldn't justify a couple hundred $$ on a Princess Auto bead roller as nice as that would be, so I stole an idea from the net. It took a lot of filing and grinding but it works well. It makes a pretty good bead on flat aluminum, so I hope it will work well on the piping too. Not looking for perfection and you won't see the beading anyway as they're hidden under couplers. I'll post up a pic of a bead after I fit and cut the various pipes. Last edited by 06YarisRS; 04-15-2019 at 09:01 PM. Its the learning process you crave. Much like many of us, I bet its the challenge you enjoy. For sure, myfirstyota. I have to constantly fight the urge to rush things/take shortcuts. That said, a lot of aspects of the project are compromises. I was out investigating how the heater hoses will play with my planned intake. 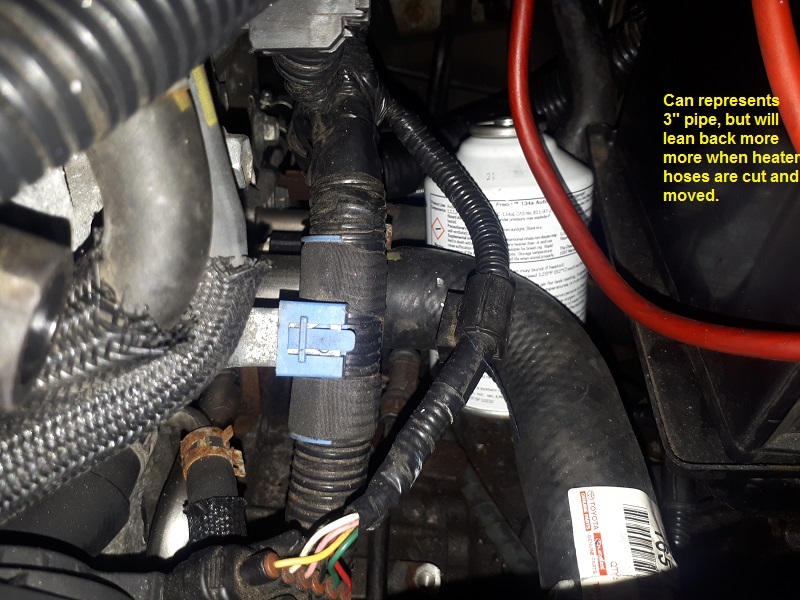 It looks as though it will work with the trickiest part being getting the 3" piping down between the block side heater port and rad hose. I may need to splice in a coupler there for flexibility. Since I'm having to cut the heater hoses to attach to the turbo, I can then rotate the cut pipe ends out of the way. I'll also need to shave about 3/8" off the plastic battery tray. Interestingly, I had an old R134 A/C refrigerant can lying around and it's precisely 3" in diameter. I used it to test clearance for the 3" intake pipes. Worked like a charm. There is one cast tab on the head at the back of the motor that will need to be ground down slightly, as well as the removal of a steel bracket that I think was used for a harness support. I'll also have to slightly bend the transmission dipstick tube and overflow tube a bit out of the way. Other than that, it looks like a reasonably clear path. i love this thread. great progress made and that home made bead roller is something else. How did you manage to make that? Thanks Trevor! It's short piece of 1/4 steel rod welded onto the top jaw. This I had done by our shop teacher as I don't weld. I had to curve the 1/4" rod with a flat file as obviously I'm beading round pipe. I then used a pneumatic grinder and roughed out the cup in the bottom jaw and finished with a rat tail file. It's far from perfect but seems to work great. This will be a touchy project, but I'm confident it can be done. Another job during which I wish I had 3 - 4 hands. The holes in the downpipe flange are large - for a good reason - to allow for lots of play when fitting the pipe (necessary). This makes it want to bounce around a lot while installing. It also allows for an improper alignment if you're not careful. 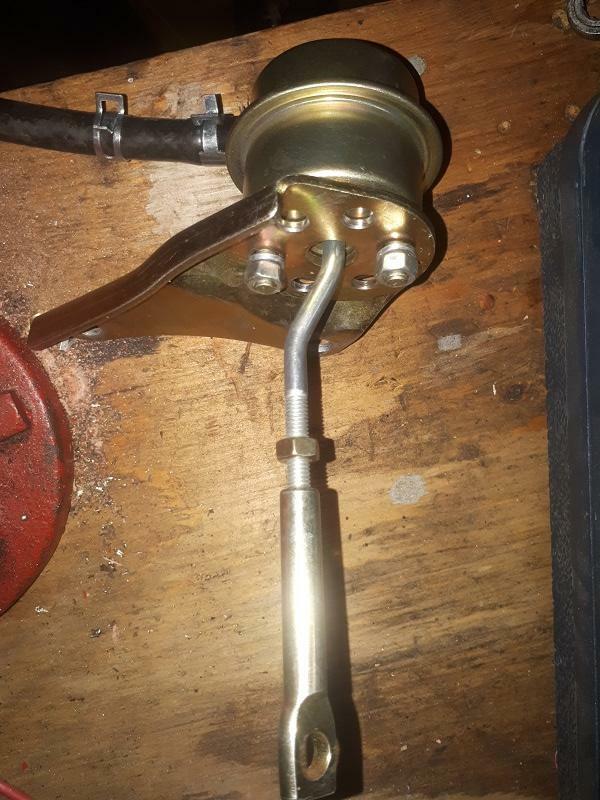 I had to support the pipe on the crossmember to maintain the approximate 1" - 1.5" vertical clearance while at the same time trying not to mess up my high temp copper rtv that is on both sides of the metal flange gasket. 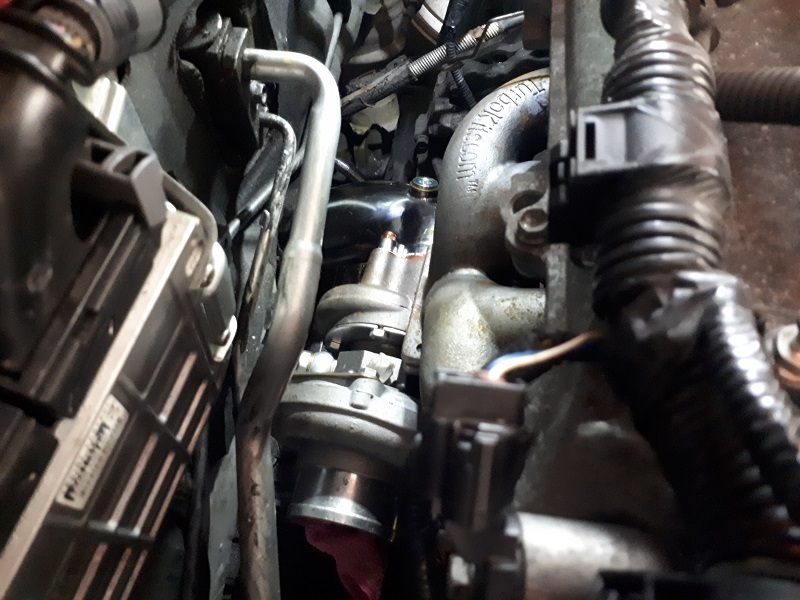 The nuts that attach the downpipe to the turbo (same type that attach the turbo to the manifold) are soft copper which is great as they bite well and shouldn't back off with the included Belleville washers installed under the nuts. Man, this baby should flow! The Corolla obviously has its post-cat 02 sensor entering from the passenger side as opposed to the Yaris, from the driver's side. However, I'll be installing a cat, so a large section of the beautiful 3" stainless steel after the braided flex joint will have to go. I'll have a bung welded into the pipe after the cat. I may need to extend the wire on the sensor and attach it somewhere in the tunnel. I haven't reinstalled the heat shield yet, but will as there is lots of room to get back under the downpipe. It's an absolutely lovely downpipe btw. Last edited by 06YarisRS; 04-22-2019 at 01:41 AM. Only had an hour and bit tonight but got a small job done. Fortunately the hoses were molded in a way that I could cut them up and use them. 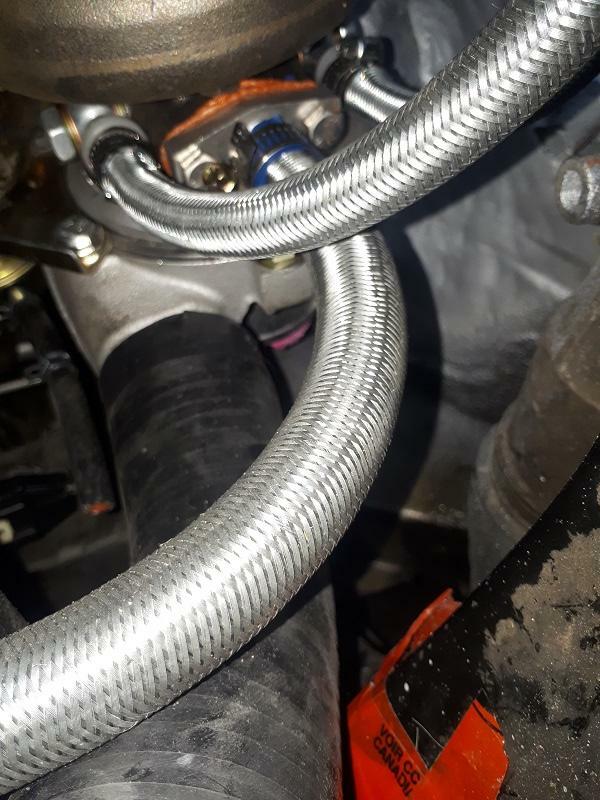 Thankfully turbokits allowed enough steel braided coolant hose length to attach to the car's heater lines from any angle. Cleared up a large amount of space. 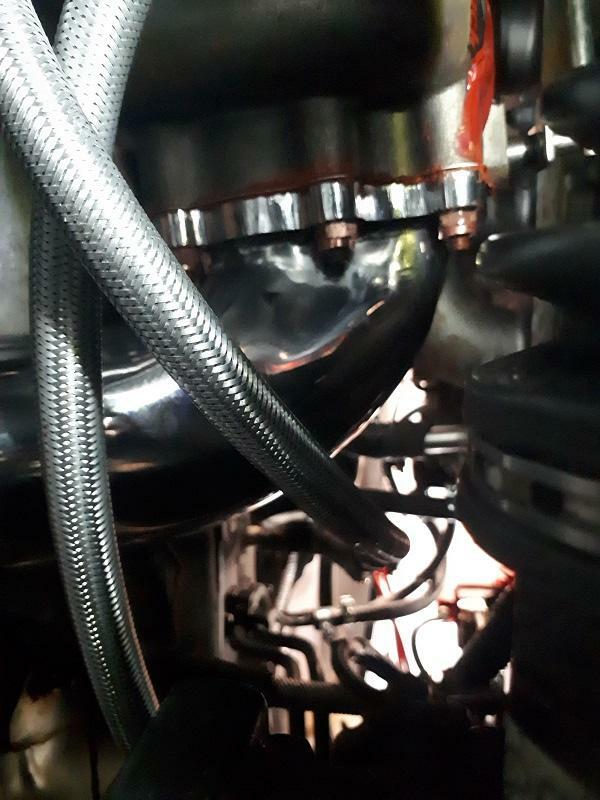 The 3" intake piping should fit easily now down and through to the stock airbox area for filter placement. I removed the battery and trimmed back the tray; allowing myself an additional 3/8" - 1/2" space. The only challenge left here is that the heater hose that goes into the firewall will be almost touching the 3" piping. If the engine rocks back, it may pinch the hose a bit. 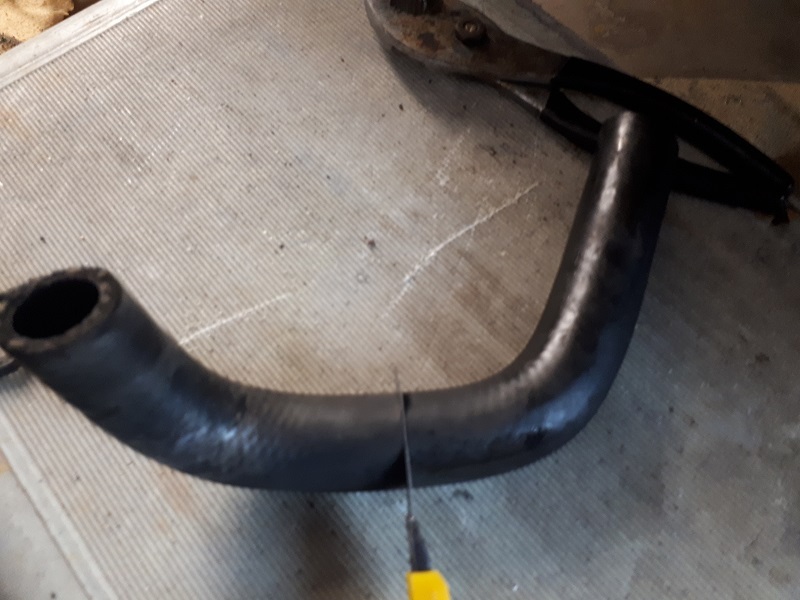 But, the 3" 90 piping I ordered has a very gradual curve (I guess mainly for smooth air flow), but the radius may work out perfectly; leaving space for the heater hose at the firewall. Fingers crossed. If that fails, I'll figure out a way to solder on a 90 fitting on the firewall heater hose connection. I'm hoping that with all this additional plumbing, I won't have difficulty priming the cooling system. A shot from below. I'll use a good heat resistant zip tie or something else to secure these two hoses together where they cross eachother. Other than that, the turbo braided hoseing is rigid enough that it is not touching any part of the car or engine...bonus. Tomorrow, time permitting, I'm going to prime the turbo with oil and hook up the oil supply line. Last edited by 06YarisRS; 04-17-2019 at 11:01 PM. Some day I'll make better ones.